South Asia Quake Scars Youngest Survivors The earthquake that ripped through South Asia more than a week ago devastated the Pakistani population. Among the most vulnerable and needy survivors are thousands of traumatized children. International relief efforts are under way following a massive quake near the Pakistan-India border. The earthquake that ripped through South Asia more than a week ago devastated the Pakistani population. Among the most vulnerable and needy survivors are thousands of traumatized children. 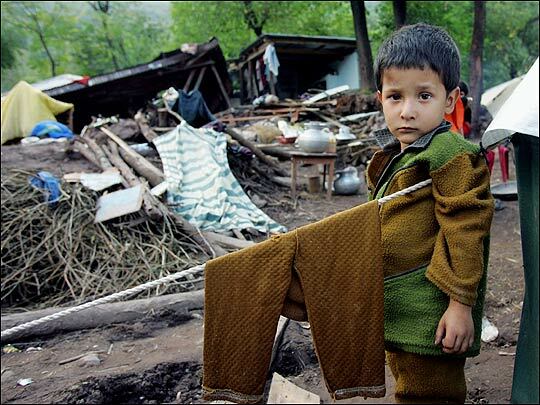 A Kashmiri boy stands in front of a demolished building in Garhi Dupatta, near Muzaffarabad, capital of Pakistan-administered Kashmir. We're going next to South Asia, where the people hardest hit by this month's earthquake turn out to be children. They're among the most vulnerable of the two million people left homeless by the disaster. 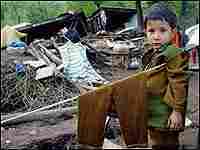 Many children remain stranded in the foothills of the Himalayas. Aid agencies are scrambling to rescue children from exposure and provide medical care as well as counseling to those who've been saved. NPR's Philip Reeves reports. At a temporary shelter in Islamabad, the children of the earthquake are breakfasting on hot milk and bread. They've come here from the hills of Pakistani-controlled Kashmir. They were badly traumatized by the quake and, says Amasbaht(ph), who's helping run this center, by the subsequent aftershocks and storms that have rolled through the Pakistani capital in recent days. AMASBAHT (Aid Worker): Some of them are very frightened, and last night when there was thunder, they all started to cry and said, `Oh, my God, this is happening again. Again! The earthquakes come! Let's get out! Let's get out!' Those who can speak and these older children, they started to cry. Ms. EILEEN LAZAR(ph) (SOS Children's Villages): They're stunned. They're dazed. They're confused. They don't know which end is up. They don't know what's happened. They don't know why it's happened. Like walking zombies, I would say. REEVES: Eileen Lazar is from SOS Children's Villages of Pakistan, the NGO running the shelter. It's mounting a major operation that centers in Pakistan to care for some of the thousands of children displaced by the quake, many of whom have lost their parents. Ms. LAZAR: Our main goal is to get as many displaced children as possible, bring them here to our shelter, give them the initial things of food, shelter, protection, you know, whatever they need--health-care needs, and then we want--we have a system where we're going to register each of them, take pictures of them and get as much information as we can and post it so that maybe their parents are someplace else and they're looking for their kids. And our ultimate goal is if their parents are alive and they're in some other camp somewhere else, we can reunite them. REEVES: But Michael Bociurkiw of the UN children's agency, UNICEF, says children comprise a large proportion of the victims. Mr. MICHAEL BOCIURKIW (UNICEF): Half are 18 and under, and one-fifth of the population is five and under. Five and under now, you're talking about the most vulnerable kids. And right now, when the weather is turning cold and wet, these are the kids who need, you know, assistance right away in terms of proper nutrition, in terms of keeping warm and most importantly, in terms of shelter. REEVES: At Islamabad's Children's Hospital, beds fill the corridors in the main hall. Doctors here have been working around the clock since the quake, among them, Professor Mansur Jamal(ph), a pediatrician. Professor MANSUR JAMAL (Pediatrician): Apart from these physical injuries and the gangrene and the amputation and the lot of psychological turmoil that we--it's very difficult to cope with this psychological trauma and the children don't know what will happen next. REEVES: Dealing with injured and traumatized children is the immediate challenge, but there are many more long-term problems. Michael Bociurkiw of UNICEF says the education infrastructure in much of the disaster zone has been completely destroyed. Many teachers have been killed. Mr. BOCIURKIW: It's hard to compare this to any other tragedy we've seen. The damage is absolutely massive. In one province alone, the estimate is of 8,000 schools flattened. I did a tour by helicopter the other day, and every village I visited, the school was just non-existent. REEVES: There's no accurate estimate of the cost of rebuilding. Relief and rescue services have yet to reach some outlying areas, but it will be huge. Philip Reeves, NPR News, Islamabad. INSKEEP: Of course, Kashmir had a troubled history long before this earthquake, and you can read about this region's active geology and its active politics at npr.org. You're listening to MORNING EDITION from NPR News.